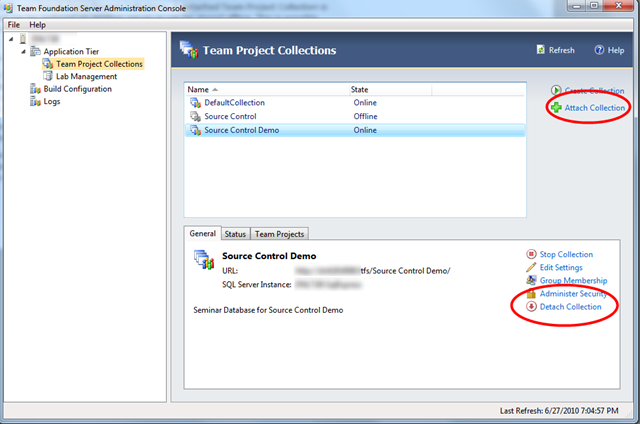 In TFS 2010 Team Project Collections are introduced. This is great because it allows you to maintain your Team Projects in a better way. With TFS 2008 you had to build a complete new server for it. For an overview of Team Project Collections read this article by Brian Harry. You can attach and detach Team Project Collections. A detached Team Project Collection is portable and can be restored on another server or can be stored offline. This is possible because, in contrary of TFS 2008, all information is stored in one database per Team Project Collection. Last week I was preparing some demos for my presentation. I made a backup of my Team Project Collection after I set this collection “offline”. After a while I restored the database and everything was fine. Later on, I detached my TPC and copied it somewhere else. Then I restored my earlier (offline and thus attached) Team Project Collection. Then my problem came up. I could not attach my TPC anymore (somewhat logical) and I could not access my data. It became a long night to put al my demo’s back in place. Only properly de-attached Team Project Collections can be reattached! if you backup your collection database, make sure to know in what state it is. Put in the backup name so that you don’t get in trouble if you must attach,detach or bring your TPC on or offline.